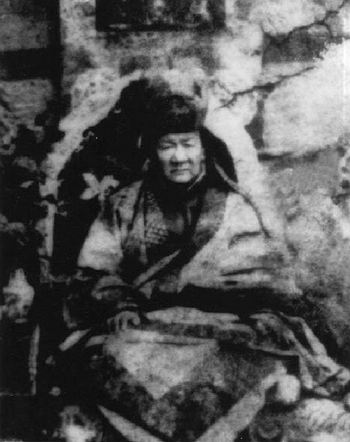 Tokden Paksam Gyatso aka Ngagi Wangpo (Tib. རྟོགས་ལྡན་དཔག་བསམ་རྒྱ་མཚོ, Wyl. rtogs ldan dpag bsam rgya mtsho), or the Eighth Drukpa Yongdzin (birth 19th century), was a major Drukpa Kagyü lama, and a direct student of Tokden Shakya Shri. One of his living disciples is Soktse Rinpoche. Being a siddha, Shakya Shri would remain detached and indifferent no matter who came, with two exceptions. One was the Eighth Drukpa Yongdzin, the rebirth of one of Shakya Shri's gurus; when he arrived, the master would show particular respect, saying, "Be on your toes! Yongdzin Rinpoche has come!." Tokden Paksam Gyatso also studied with Khakhyap Dorje, the 15th Karmapa. As a tertön, Tokden Paksam Gyatso revealed a terma teaching from Guru Rinpoche called Samlhun Lha Chuksum, based on the Thirteen Manifestations of Guru Rinpoche. This treasure teaching was authenticated by Dudjom Rinpoche and is still widely practised to this day. When Tokden Paksam Gyatso left his monastery during the later years of his life, the previous Chhoje Rinpoche accompanied him. Together, they traveled to Namkha Khyung Dzong in western Tibet, where the previous Chhoje Rinpoche accomplished six years of retreat under the guidance of Degyal Rinpoche, a senior student of Dudjom Lingpa in Western Tibet. Dudjom Rinpoche held Tokden Paksam Gyatso in high esteem. The 15th Karmapa, Khakhyab Dorje had been one of Ngagi Wangpo’s root teachers. Ngagi Wangpo did eventually meet the young 16th Karmapa, Rangjung Rigpé Dorje, at Samye, exactly as the prophecy had predicted. Ngagi Wangpo offered an empowerment to his root teacher’s reincarnation and performed a Khandro Sundok to dispel obstacles to his life. Tokden Paksam Gyatso’s special practice throughout his life was the Rigdzin Sokdrup, the revelation of Lhatsün Namkha Jikmé. One of his living disciples is Soktse Rinpoche aka Kunzang Tendzin Gyaltsen, who he recognized as the 6th Soktse Rinpoche. Another Yongdzin Rinpoche, who died in a car accident in 1995. His rebirth had been recognized as the Tenth Drukpa Yongdzin by Gyalwang Drukchen Rinpoche. Tulku Urgyen Rinpoche, Blazing Splendor: The Memoirs of Tulku Urgyen Rinpoche (Boudhanath, Hong Kong, Esby: Rangjung Yeshe Publications, 2005), Ch.13, 'Shakya Shri, the Lord of Siddhas", page 129-131. This page was last edited on 17 June 2018, at 22:51.